Dee Gordon thought his words would be enough for everyone to understand the situation. They’d come from his heart. They were honest and emotional. They said everything that he wanted to his hero, his friend and his teammate — Ichiro. So when the media surrounded his locker Thursday afternoon, hours before the Mariners’ home opener at T-Mobile Park, he was a little taken aback. “Uh, I did not expect all of this,” he said with wide eyes. 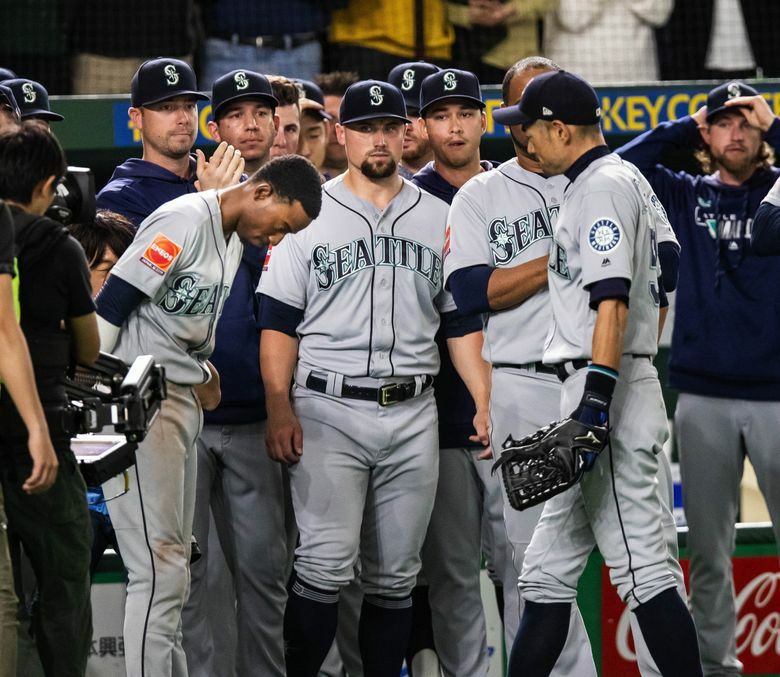 But his decision to take out a full-page ad in Thursday’s Seattle Times sports section to personally thank Ichiro was such an unexpected gesture that people had to ask about it. His words weren’t going to be enough. Dee Gordon took out a full-page ad in Thursday’s Seattle Times sports section honoring teammate and friend Ichiro. The decision process came during a sleepless night after the team returned from Tokyo. “One night I was kind of jet lagged and still up and I texted my agent in the middle of night, telling him I want to do this,” Gordon said. Gordon’s agent, Nate Heisler, contacted the Times about the possibility on Saturday, March 23, inquiring about taking out an ad on behalf of his client. The next task was deciding on what Gordon wanted to say in the ad. He wanted to thank Ichiro for everything that he’d meant to him, which wasn’t easy to put into words. So he sat down and began to write out what he wanted to say via text message. That’s a long text, but jet lag helps. But it was more than a time-zone change that caused Gordon to take out the ad. Gordon feared that the ultra-private Ichiro might not like it and become upset. Ichiro’s retirement in Japan was a momentous occasion. Few players get honored in that way. “First of all, I want to say thank you for being a great friend to me and being my favorite player to this day. “You made me want to play baseball. I idolized you as a kid in Avon Park. We even named a player after you in an old video game that came out before I was born. “The next day, you were traded to the Yankees before I could even talk to you about hitting. I was crushed, but then came 2015. I had just been traded to Miami, and a few days later, you signed there! “People don’t know how much you’ve helped me over these last five years, Ichi. We both know I’ve had good times, bad times, ups and downs, but your friendship has never wavered once. You always stuck by my side through anything, and always had my back. If I was wronged, you would stick up for me every time, even if it hurt you getting on the field. “I didn’t think a tweet or Instagram post was appropriate for this occasion, so I wanted to do it in the right way and tell you how much I appreciate you as loudly as possible. Without your friendship and guidance — and if you never told me your secrets (don’t worry, bro, I’ll never tell!) — there wouldn’t be a batting champion named Dee Gordon. Gordon signed the letter with his birth name.